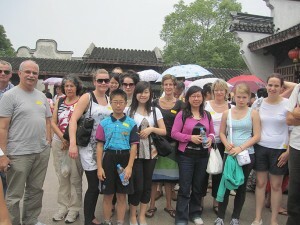 On Wednesday, June 16th, students and teachers experienced the mystery of an ancient Chinese water town – Wuzhen! Students and teachers took a break from their Chinese language courses and enjoyed a full day of adventure and fun – marveling at the beautiful scenery and learning about the town’s thousand years of history. easyMandarin, also known as “Easy Mandarin” or “eM”, is one of China’s leading Chinese language training schools. The school was established in the year 2006 and since then has taught Mandarin to thousands of individuals from more than 60 countries, including overseas students, interns, CEOs, heads of NGOs, consulate generals, and people just visiting China to experience the language and culture. eM is based in Shanghai, China and is internationally accredited by CSN.